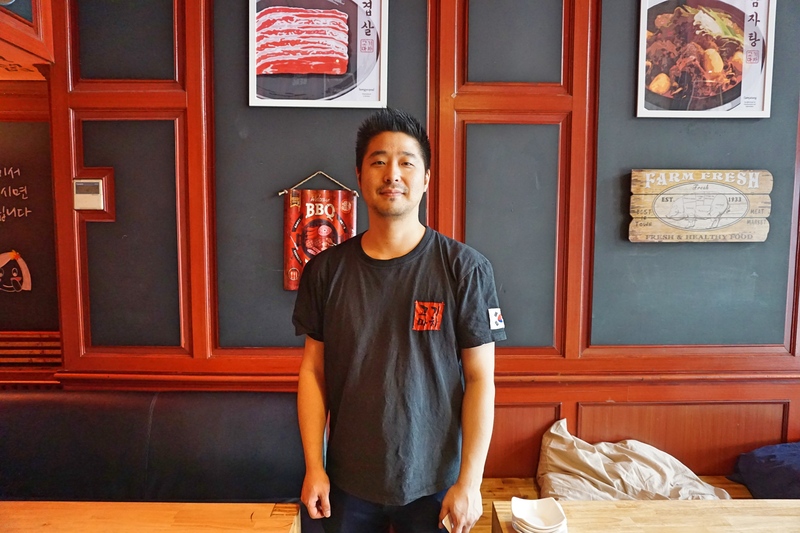 Last month I sat down with manager Park at the barbecue-focused Korean restaurant Gogi Matcha (고기 마차) in Düsseldorf to talk about authenticity and customer expectations. My partner and I entered the restaurant not long before the end of lunch time service on a Friday afternoon. Glancing around before we picked a table, we felt as if we had entered a Korean restaurant in Seoul. The way the tables were laid out, the tables themselves with in-built grills, the seat benches designed for two people or more, they all screamed of commensality, a central aspect to Korean eating culture. It was also immediately apparent that this was a place frequented by regulars. The atmosphere was relaxed, as were the waiters and the customers too: two Chinese women with a mountain of food sitting in the corner, chatting and giggling away, a group of young Koreans seated at the table next to a large window, laughing and grilling their samgyeopsal (pork belly), and a middle-aged Korean woman sitting by herself but deeply engaged in a chat conversation on her phone. We ordered one of the typical barbecue sets (“typical” meaning as it is commonly had in Korea) – it was not advertised as such, but all the dishes needed for it were available on the menu: beef barbecue, doenjang jjigae (beanpaste stew), bibim-naengmyeon (spicy cold noodles), and bibimbap (rice mixed with vegetables). As soon as dishes started appearing, it became even more apparent that the path this restaurant had chosen to take was to emulate Korean eating culture as much as possible. Cold boricha (barley tea) was served for free in a typical plastic jar, along with five side dishes, and (for the barbecue) two different sauces with spring onion cut in thin strips and ssam lettuce leaves (all presented in classic Korean dishes). Metal chopsticks and spoons were kept with napkins in a glass on the table along with spare small plates for customers to use as they wish – much like one would be able to find in most restaurants in Korea. In a typically Korean commensal way, where even when eating out one engages with one’s food in some way before eating, we grilled and then wrapped the meat in ssam lettuce leaves, adding on top some stripes of the spring onion salad, some morsels of side dishes, and some sauce as well: gireumjang (sesame oil sauce with salt for dipping the meat into) and ssamjang (bean paste sauce for wrapping in the lettuce leaves). It was, in short, a meal made for those with standards set in Korea. And manager Park confirmed: whereas customers who have never been to Korea may not know what to expect in terms of serving culture and taste, Koreans already have specific expectations that need to be met. If they’re satisfied, they are likely to return in their quest for the most “authentic” Korean food – authentic in the sense that such flavours and styles of eating can also be found way back home. Mr. Park, who started at Gogi Matcha as assistant chef seven years ago, took a break from the restaurant only to return and work in the service department. It was not long before he became manager. He oversees customers’ preferences and gives feedback to the chef, thus allowing for changes in side dishes offered, and menu changes roughly once a year. But dishes offered, Mr. Park explained, – the way they’re cooked, their flavour profiles – remain authentic, because they do not much diverge from how we would be able to find them in restaurants in Korea. The taste is kept more mild, not exaggeratedly salty, as Mr. Park describes one of the common attributes of German food. Mr. Park continues that, in this aspect of lesser saltiness, and in adhering to traditional Korean cooking styles, the food at Gogi Matcha cannot be seen as Germanized. This lies in contrast to other Korean restaurants Mr. Park knows, where the food has become saltier and where frying the food with a wok has become the preferred cooking style (a fascinating fusion then between German, Chinese, and Korean food). Fermented foods are freshly prepared not only for their Düsseldorf location, but for their other two restaurants in Cologne and Heidelberg as well. At that point I contemplate my own homefood cravings when travelling, and realize that it took no more than three weeks during my stay in Korea to madly crave potatoes, bread and cheese. My body wanted it and so did I. Despite potatoes and cheese being integrated in some Korean dishes today, imagine my excitement when I came across a European restaurant. Yes, food habits can definitely be changed, but some roots lie deeper than others. Have you experienced homefoodsickness? Let me know in the comments below. This is part of a series on the challenges and innovations for Korean restaurants abroad. If you’d like to read more, see the Soban article (Krefeld, Germany), or the Arirang article (Stockholm).